The voracious appetite of Pacman frogs makes them a popular choice as a pet. However, like most other amphibians, these frogs require a very specific habitat and special care in order to survive and thrive in captivity. Therefore, it is essential that anyone considering getting a Pacman frog first does their research and fully understands exactly what goes into caring for these colorful creatures. What is a Pacman Frog? The name Pacman frog is applied to a number of different types of horned frogs native to the humid rainforests of South America. All Pacman frogs belong to the same genus, Ceratophrys, which is where the name horned frog is derived from. Although there are a wide variety of different species, all of these horned frogs have pointed eyelids that resemble horns. While the name horned frog comes from their shape, the name Pacman frog is directly related to their behavior. 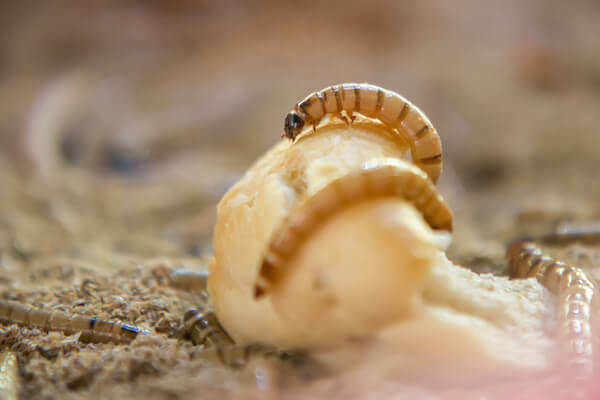 Specifically, the name comes from the fact that they have a voracious appetite and will devour any and all insects in front of them. The frogs generally spend most of their time buried deep in the dirt, with only their eyes and horns exposed, watching and waiting for any insects to pass by. As ambush predators, the frogs are quite docile and spend almost all of their time lying still, which tends to make them quite easy to care for. However, it is important to never keep more than one Pacman frog in an enclosure as they are highly territorial and can be fierce fighters. 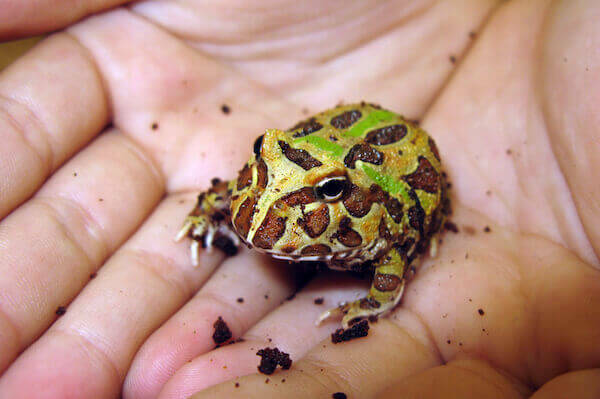 The majority of Pacman frogs sold online and in pet stores are bred in captivity, although some wild-caught imports are also still available. Most frogs are approximately the size of the quarter when sold and will usually grow to their full adult size in around one-and-a-half years. A female frog can grow to anywhere between 4 and 7 inches depending on the species, whereas males are slightly smaller and usually only reach 2 to 4 inches. Smaller, baby Pacman frogs can easily be kept in a small plastic terrarium or other reptile enclosure. However, the frogs will need a much bigger home once they start to grow, and an adult Pacman frog needs at least a 10 to 20-gallon enclosure. The temperature inside the aquarium needs to stay consistently between 65 and 80 degrees Fahrenheit and preferably on the lower end of the scale since the frogs generally spend all their time burrowed down in the cooler soil. Generally speaking, the daytime temperature should be between 75 and 85 degrees, while nighttime temperatures can be between 65 and 75 degrees. You’ll want to make sure to use a thermometer to constantly measure the temperature, and it may be necessary to use an under-tank heater or heat lamp in order to ensure the proper temperature. In addition, you’ll also need to keep the humidity level in the terrarium between 50 and 80 percent. If you live in a particularly dry area, live plants should help to increase the humidity level. Finally, you’ll want to make sure that the terrarium receives plenty of light for around 12 hours a day in order to better mimic the natural day and night conditions. 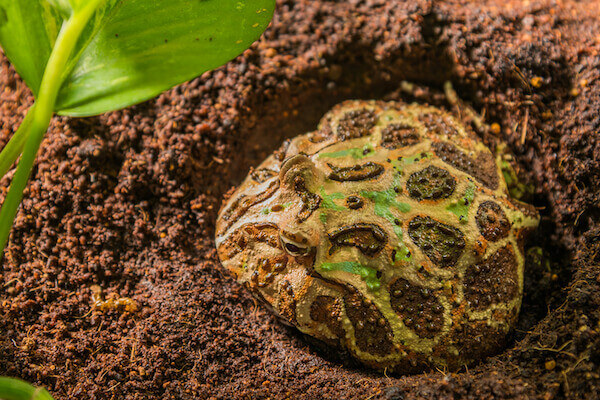 Pacman frogs love to dig and burrow, which means that their enclosure needs to contain a deep layer of substrate (2 to 4 inches) to ensure they can burrow themselves down deep enough. Otherwise, the frog might not eat if it can’t burrow down far enough to ambush its prey. You’ll need to make sure that the substrate is continually kept moist. However, it also shouldn’t ever be soaking wet as this could potentially lead to health problems. In addition, you’ll want to add live plants and branches to the terrarium to give the frog a place to hide. However, you’ll need to make sure that whatever plants you choose are appropriate for the species. Pacman frogs are mostly nocturnal, which means that it’s always best to feed them in the evenings. Like other frogs, Pacmans are insectivores and will eat a wide range of different silkworms, crickets, mealworms and waxworms. It is usually best to feed the frog every two to three days, and you’ll want to make sure to not feed it more than it can eat overnight. If you notice some insects are still crawling around in the morning, you’ll obviously want to feed them slightly less next time. Vitamin D and calcium are both extremely important for Pacman frogs, which means it’s a good idea to dust the insects with supplemental calcium once or twice a week. There are numerous supplement powders designed specifically for Pacman frogs, many of which contain both calcium and vitamin D, and these products can be a simple way of ensuring that your frog receives enough of these essential nutrients. Pacman frogs spend most of their time lying in one place waiting for insects, which means that there is no reason to worry if your frog isn’t very active or mostly just sits there staring. However, if you suddenly notice that your frog spends more time hiding than usual, it could be a sign that there’s something wrong with it. In this case, you’ll want to take it to a vet to have it checked out. In addition, you should also contact a vet if you notice any of these other issues. Although they tend to be quite easy to care for, Pacman frogs do have very sensitive skin. This means that they should be handled as little as possible, and it is essential that you always wash your hands thoroughly before or after handling them or cleaning their cage. As well, it is especially important that you try not to handle new Pacman frogs for the first week or so in order to make it easier for them to acclimate and settle-in to their new home. Making sure the frog’s enclosure stays clean is one of the best ways to prevent potential health problems. Therefore, you’ll want to make sure that you diligently pick up their droppings regularly, preferably every day if possible. As well, you’ll want to give them a new dish of water to sit in every few days. It’s also necessary to completely change out the substrate and rinse out the enclosure at least once a month. As long as you follow these simple tips and make sure your frog gets plenty of food, you have a good chance of the frog living for anywhere between five and 15 years.